Huawei P30 series now available in the Philippines, nationwide! 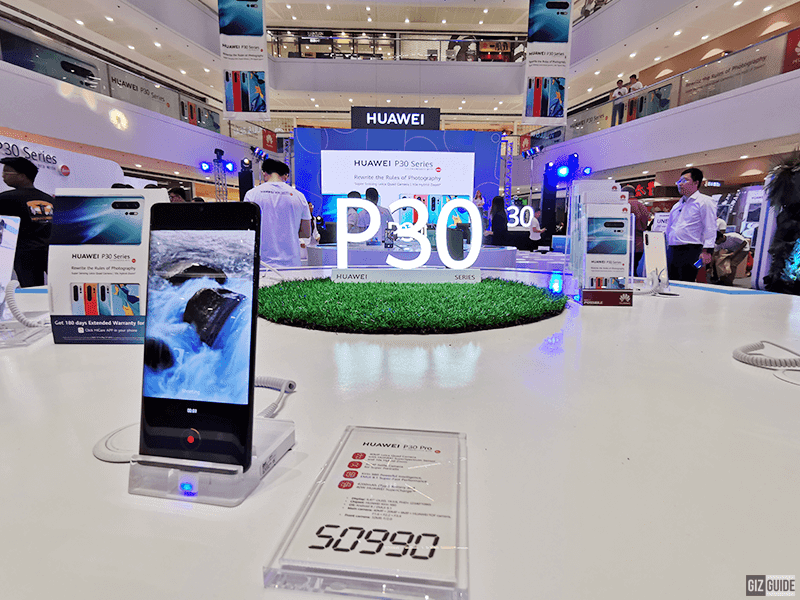 Home / huawei / mobile / news / Huawei P30 series now available in the Philippines, nationwide! Right on schedule, Huawei made the entire P30 series available in the Philippines. The 3 new phones are the P30 lite, P30, and the P30 Pro. P30 series are photography-focused smartphones with improved camera systems versus their predecessors. The P30 lite now features a 24MP f/1.8 + 8MP 120-degree ultra wide-angle lens + 2MP f/2.4 camera. P30 is equipped with a new Leica triple-camera system using a 40MP f/1.8 RGB OIS sensor + 16MP f/2.2 ultra wide-angle sensor + 8MP f/2.4 3x zoom sensor paired w/ 4D predictive focus, AIS, color temperature sensor, and dual-tone LED flash. P30 Pro is the current top photography phone in the market according to DxOMark. All three phones are also loaded with the new 32MP selfie camera with AI HDR and face beauty. P30 lite is the mid-ranger with 6.15-inch screen, Kirin 710 chip, 6GB RAM, 128GB storage, and 3,340mAh battery. P30 is the compact flagship with a 6.1-inch screen, 7nm Kirin 980 flagship SoC, 8GB RAM, 128GB storage, and 3,650mAh battery with 22.5W SuperCharge. P30 Pro is the high-end device with a 6.47-inch panel, Kirin 980 SoC, 8GB RAM, 256GB storage, and 4,200mAh battery with 40W SuperCharge. It is also one of the few phones with a reverse wireless charging tech, In-Display earspeaker, and 4G LTE Cat 21 connectivity. P30 lite is priced at PHP 16,990. P30 Pro is priced at PHP 36,990. P30 Pro is priced at PHP 50,990. Those who pre-ordered got a FREE Huawei Watch GT worth PHP 12,990. The first 40 who pre-ordered at Huawei SM Megamall also got an extra MediaPad M5 lite priced at PHP 18,990. 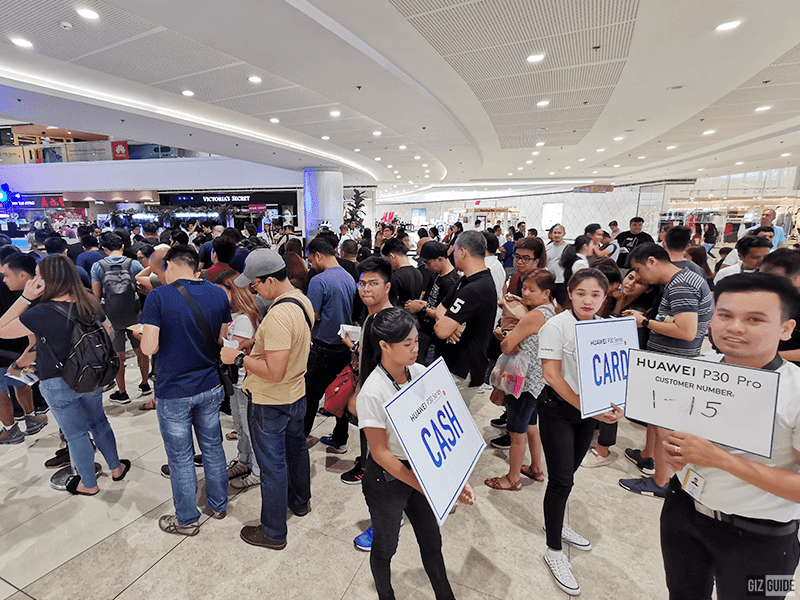 As expected, people lined up and flocked the Huawei P30 launch in PH.